Set to the tune of "The Farmer in the Dell " this latest colorful board book in the Cuddle and Sing Series introduces toddlers to the joy of Christmas. Debby Anderson's vivid illustrations and delightful words teach little ones about the shepherds the wise men and why Jesus's birthday is a time to celebrate! With a Faith Parenting Guide included Jesus Is Born helps families talk about why Jesus is the best Christmas gift ever. Cuddle and Sing is the bestselling board book series that teaches the love of Jesus to children ages 3 and under. This is the fifth book in the series following Jesus Loves Me Jesus Loves the Little Children Jesus Is with Me and Jesus Is Alive. 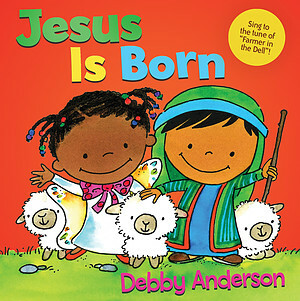 Debby Anderson has written and illustrated 30 books for children including the bestselling Jesus Loves Me and Jesus Loves the Little Children in the Cuddle and Sing Series. She lives with her husband in Vancouver Washington. They have four married children and nine grandchildren.She teaches first grade and is involved in a variety of cross-cultural ministries. Jesus Is Born by Debby Anderson was published by David C Cook in September 2017 and is our 38554th best seller. The ISBN for Jesus Is Born is 9781434711168. Be the first to review Jesus Is Born! Got a question? No problem! Just click here to ask us about Jesus Is Born.